How bizarre is it not to post though you have plenty of time? Let me explain: I finally sat my last exam (for this summer) last friday. And then.... nothing. You know this kind of idle running in the brain? No stress, no occupations, only weekend and loads of spare time. The idea was of course to relax, knit, read (fun stuff! ), watch videos or something like that. You've got the first hint in this list: so many postponed leisure activities that it looks like stress again. Sigh! It is soo hard to decide which project to work on! The Lacy Scallops sock is a bit of a pain in the a... I'm not talking about the knitting, the pattern is fun. I'm not talking about the colours, they simply rock. 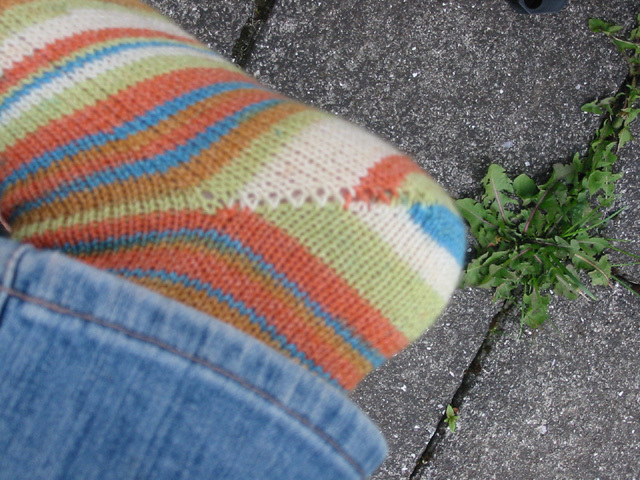 But after turning the heel it just doesn't feel right anymore. The tension on the foot is different from that on the leg. And the fit at all.. [grump] Better put it aside for some while and wait for inspiration, right? The Cordelia socks are great. 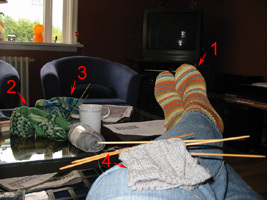 What a "fun and fast" project, completely mindless knitting during my exam reading. I only regret that I almost didn't realize the fun striping effect while knitting blind. by Carola at 4:24 e.h. It could just be the short row heel wraps that are causing the holes? When I did short row bust darts in another pattern, not for socks obviously, it caused little holes, but I was told once I blocked it, it should be fine. I've heard that the Japanese short-row techniques doesn't cause holes, but I can't vouch for it personally. ágúst 30, 2005 3:35 f.h.